A consultant to international bodies such as the World Health Organization (WHO) and the United Nations Children’s Fund (UNICEF). Medical historian and health educator Maureen Minchin has been involved in global efforts to promote evidence-based infant feeding for decades, and is internationally recognised for her pivotal role in creating the lactation consultant profession. She has been a consultant to international bodies such as the World Health Organization (WHO) and the United Nations Children’s Fund (UNICEF). She has educated health professionals, including through creating university-based courses in the UK and Australia. And she is an Editorial Board member for the open-access online International Breastfeeding Journal. Maureen is also the author of influential books such as Food For Thought: A Parent’s Guide to Food Intolerance and Breastfeeding Matters: what we need to know about infant feeding, as well as journal articles and background briefing papers. Having three children in the 1970s, she experienced hospital practices that made breastfeeding difficult and allergy inevitable, with life-changing consequences for her children. She has since spent a lifetime providing advice and support to allergic families, while also working to improve health professionals’ education and training. Writing influential and ground-breaking texts on infant feeding. This book is the culmination of more than 30 years of learning from both the scientific literature and from clinical experience. Reproductive biologist and University of Melbourne Honorary Emeritus Fellow Roger Short has said, “I have read Milk Matters from cover to cover. It is truly amazing. I learned something on virtually every page!” Earlier books were similarly original and challenging: Breastfeeding Matters (first published in 1985) was called “a milestone in breastfeeding history” by Professor David Baum, and generated many research projects; Food for Thought (first published in 1982) led to an unprecedented invitation to become an Associate Member of the Australian College of Allergy “in recognition of work educating the lay public about food allergy”. Both these earlier books have sold more than 25,000 copies and gone through multiple editions in Australia, with overseas editions in the UK and Japan for Food for Thought. Creating and teaching in local, national and international courses, seminars and conferences. Maureen has created and taught in local, national and international courses, seminars and conferences, including in Malaysia, New Zealand, Hong Kong, the UK and the USA. 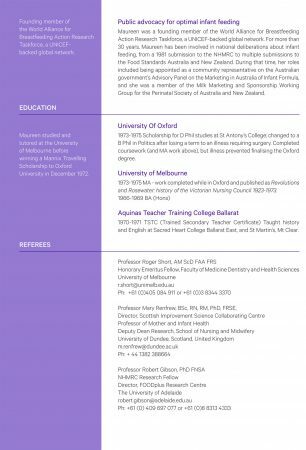 She has provided in-service education at major medical institutions in Australia and internationally, such as at the Royal Women’s Hospital in Melbourne; National Women’s Hospital in Auckland; the Royal Sick Children’s Hospital in Bristol; St George’s London; Emory University in Georgia, USA; and Beth Israel Hospital, New York. Helping develop online and distance education courses, including the University of York’s online The Challenge of Infant Feeding, and Deakin University’s Lactation and Infant Feeding course. She has also developed online and distance education courses, including Deakin University’s Lactation and Infant Feeding course and the University of York’s online The Challenge of Infant Feeding. While employed by the University of York’s Mothers and Infants Research Unit, she worked on the NHS-sponsored e-Learning for Health infant feeding units overseen by the UK Royal College of Paediatrics and Child Health. She continues to be invited to deliver conference presentations online and in person, such as Global Online Lactation Discussion (GOLD), and iLactation series of conferences, and the latest Lactation Consultants of Australia and New Zealand conference in March 2015 and Lactation Consultants of Great Britain in 2016. 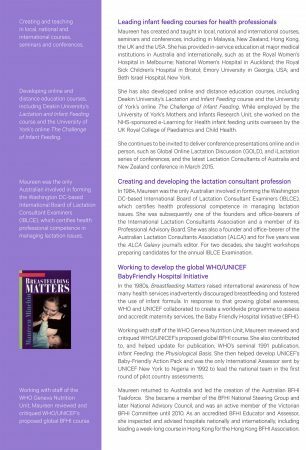 Maureen was the only Australian involved in forming the Washington DC-based International Board of Lactation Consultant Examiners (IBLCE), which certifies health professional competence in managing lactation issues. In 1984, Maureen was the only Australian involved in forming the Washington DC-based International Board of Lactation Consultant Examiners (IBLCE), which certifies health professional competence in managing lactation issues. She was subsequently one of the founders and office-bearers of the International Lactation Consultants Association and a member of its Professional Advisory Board; she initiated the WHO Code Committee and served as Chair for some years. She was also a founder and office-bearer of the Australian Lactation Consultants Association (ALCA) and for five years was the ALCA Galaxy journal’s editor. For two decades, she taught workshops preparing candidates for the annual IBLCE Examination. In the 1980s, Breastfeeding Matters raised international awareness of how many health services inadvertently discouraged breastfeeding and fostered the use of infant formula. In response to that growing global awareness, WHO and UNICEF collaborated to create a worldwide programme to assess and accredit maternity services, the Baby Friendly Hospital Initiative (BFHI). Working with staff of the WHO Geneva Nutrition Unit, Maureen reviewed and critiqued WHO/UNICEF’s proposed global BFHI course. She also contributed to, and helped update for publication, WHO’s seminal 1991 publication, Infant Feeding: the Physiological Basis. She then helped develop UNICEF’s Baby-Friendly Action Pack and was the only International Assessor sent by UNICEF New York to Nigeria in 1992 to lead the national team in the first round of pilot country assessments. Working with staff of the WHO Geneva Nutrition Unit, Maureen reviewed and critiqued WHO/UNICEF’s proposed global BFHI course. Maureen returned to Australia and led the creation of the Australian BFHI Taskforce. She became a member of the BFHI National Steering Group and later National Advisory Council, and was an active member of the Victorian BFHI Committee until 2010. As an accredited BFHI Educator and Assessor, she inspected and advised hospitals nationally and internationally, including leading a week-long course in Hong Kong for the Hong Kong BFHI Association. Founding member of the World Alliance for Breastfeeding Action Research Taskforce, a UNICEF-backed global network. 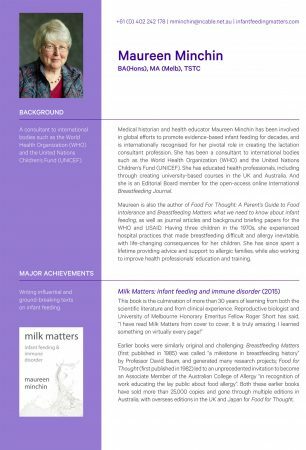 Maureen was a founding member of the World Alliance for Breastfeeding Action Research Taskforce, a UNICEF-backed global network. For more than 30 years, Maureen has been involved in national deliberations about infant feeding, from a 1981 submission to the NHMRC to multiple submissions to the Food Standards Australia and New Zealand. During that time, her roles included being appointed as a community representative on the Australian government’s Advisory Panel on the Marketing in Australia of Infant Formula, and she was a member of the Milk Marketing and Sponsorship Working Group for the Perinatal Society of Australia and New Zealand. Maureen studied and tutored at the University of Melbourne before winning a Mannix Travelling Scholarship to Oxford University in December 1972. 1973-1975 Scholarship for D Phil studies at St Antony’s College; changed to a B Phil in Politics after losing a term to an illness requiring surgery. Completed coursework (and MA work above), but illness prevented finalising the Oxford degree. 1973-1975 MA – work completed while in Oxford and published as Revolutions and Rosewater: history of the Victorian Nursing Council 1923-1973. 1970-1971 TSTC (Trained Secondary Teacher Certificate) Taught secondary history and English at Sacred Heart College Ballarat East, and St Martin’s, Mt Clear. Please click here to download a PDF version of this CV.